Nargis, who hails from Hazara Town in Quetta is the eldest of four children. 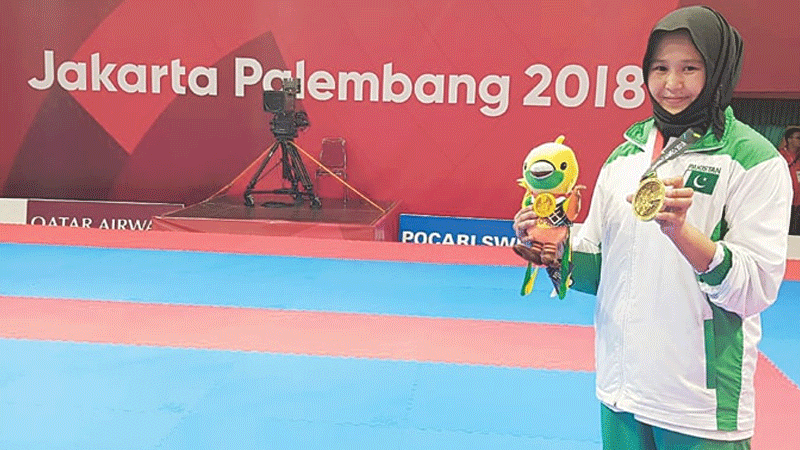 The then 17-year-old female karateka from Pakistan, who had come back empty-handed from the 4th Islamic Solidarity Games held in Baku, Azerbaijan in 2016, has now returned with a bronze medal from the recent 18th Asian Games held in Jakarta, Indonesia. “The Asiad is bigger than the Islamic Games, no doubt. The Islamic Games were also my first international outing after winning several national-level championships for Wapda. But I had trained very hard and was hoping to win a medal for my country there. I guess my God had better plans for me,” she smiles now. Speaking of her journey on the road to the Asian Games, Nargis says that the camp for the Games commenced in Islamabad soon after Eidul Fitr on June 20. “At first there were 30 boys and girls in the camp but then we heard of our funding being cut down. The trials and selection first brought us down to 20 then 14, and then 10 and eight. Finally, only six — three girls and three boys — could be a part of the Pakistan contingent. I was so glad to have made it,” she says. Coming to her recent victory, Nargis, who is 19 now and has a black belt first dan in Shotokan style, says that she had taken too much pressure before her fight. “After losing the semi-final match to the girl from China, I was informed that the girl happened to have a world ranking so my losing to her was not such a terrible thing. But then I was also told that my fight for the bronze medal was going to be with a contestant from Nepal whom I had it in me to beat. And that is what put me under pressure. “But before the fight my coach, Shah Mohammad Shah this time, whose words had stressed me out, noticed my utter panic. He covered my head with a wet towel then and asked me to stop thinking about the outcome of the fight. He told me to forget everything and make my mind go blank. But with so much going on in my head then I had no idea how to do that, and that too spontaneously,” she laughs about it now. “Anyway, there was no turning back. I stepped on the mat with trembling legs but as the fight began I started spotting my opponent’s weaknesses which I exposed to my advantage. I beat her 3-1. And then I was crying, my coach was crying. I performed the sajda and thanked my God. At the South Asian Karate Championship. Nargis, who hails from Hazara Town in Quetta is the eldest of four children. Her younger brother Ilyas is 17 and is also very good at martial arts. Then she has a 10-year-old sister Ferozina who is also into the sport along with the youngest sister, two-year-old Hadia. “But with Hadia at the moment it is more watching than practising karate,” says Nargis. “Our father, who is a former mine worker, wants all his children to take an interest in sports and studies. I started with mixed martial arts [MMA] at the age of six, but then in 2010 I switched to Shotokan karate,” she says. When asked about other sporting interests such as cricket or football, Nargis becomes a little serious. “I belong to the Hazara community. 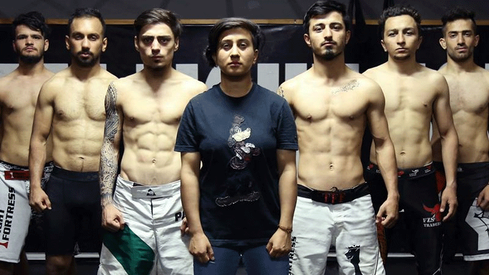 We barely go outside Hazara Town due to security reasons and the only sports clubs there offer MMA or Shotokan karate training. Still, if we feel like playing cricket or football, we can do it amongst ourselves. 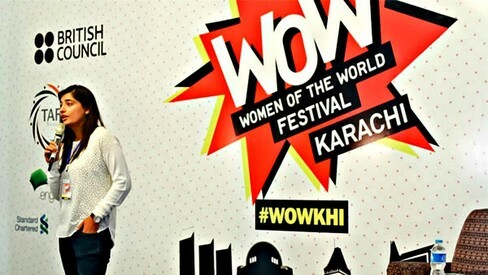 There is no proper coaching for those sports in Hazara Town,” she says. “As it is my parents are tense when I leave the town every morning to attend college. They are always relieved to find me back home safe from college,” she says. “I enjoy my studies, especially Economics, Mathematics and Statistics, as much as I do karate. I also take my books along with me to the Sports Board training camps,” she smiles. Nargis recently passed in her final intermediate exams with an A-1 grade where she got 947 out of a total of 1,100 marks. Her bronze medal shining as brightly as gold at the recent Asian Games. 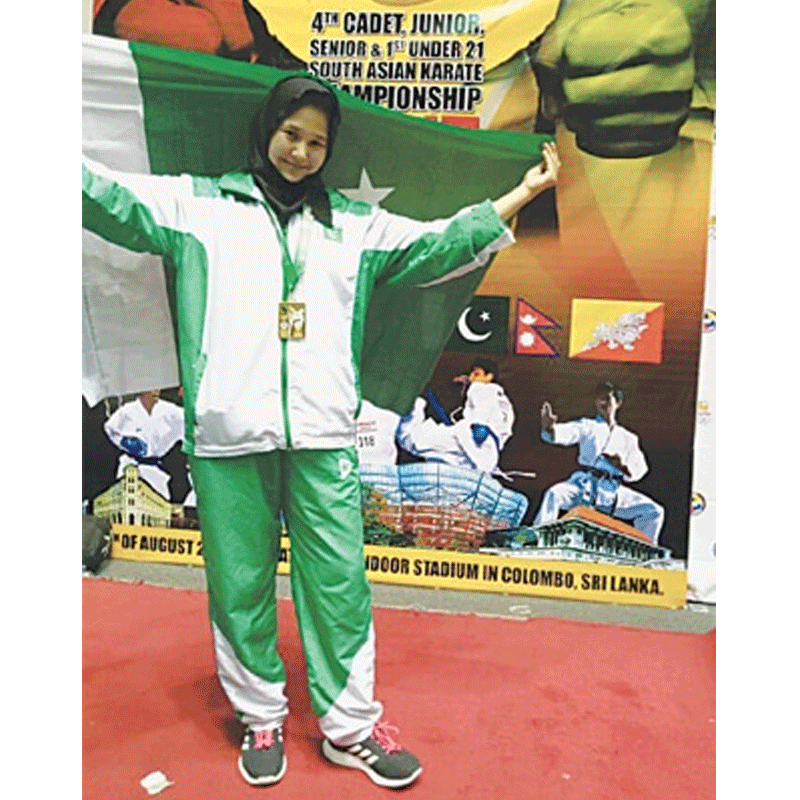 “I have requested my karate association to see if I can get a university scholarship through the Pakistan Karate Federation in Lahore,” she says. When asked if her parents will be worried for her safety if she goes to Lahore, Nargis points out that they may actually be relieved. “We are more at risk in Quetta. It is far safer in other parts of the country. I think my parents would be glad if I can move away,” she says. Very well done! Great effort and determination, I am sure you will shine. Governments at provincial and central levels must ensure Nargis gets right support to excel further. Salam to you our dear sister, we all love you and respect you. You are the pride of Pakistan. You only bring back the memories of shaheed Abrar Hussain Olympiad and hundreds of more targeted by terrorists in Pakistan and Afghanistan. We will never forget you. One of the most persecuted communities continues to rise and show its talent to the world. The whole Pakistani nation is PROUD of you Nargis !!! Keep it up our princess. Very inspiring narration. She even passed with flying colors. What a hard working community these are. Congratulation to our Pakistani Brave Young Lady. It reminded me of the movie Dangal. I wish same for her to get Gold Medal soon for Pakistan. Sports Ministry should support more to this talented lady and community. Very proud of you young lady well done.! Hats off to you, young lady!!! Greater the odds, sweeter the victory. You are such an inspiration for the young generation. Soon she will win a Gold medal in Olympics as well. Well done and congratulations young lady! Nearly 40 years ago, as a child I trained in Shotokan Karate under the tutelage of the legendary Sensei Cyril Cummins. My lightning reflexes and fierce fighting ability earned me a place as the only Asian under 12 years of age in the UK training squad for International competition. My Sensei like your Sensei was very supportive and motivating despite the casual racism, prejudice and bias against South Asians back in those days. I trained against grown adults some who went on to become world champions without gums shields, gloves or protective guards - old school! My young daughter has inherited my genes. She loves boxing and has an excruciating right cross punch! Congratulations!!! So proud of you sister!! You made whole pakistan proud. Your the best!!!!! Shabash beeta, you are the best! 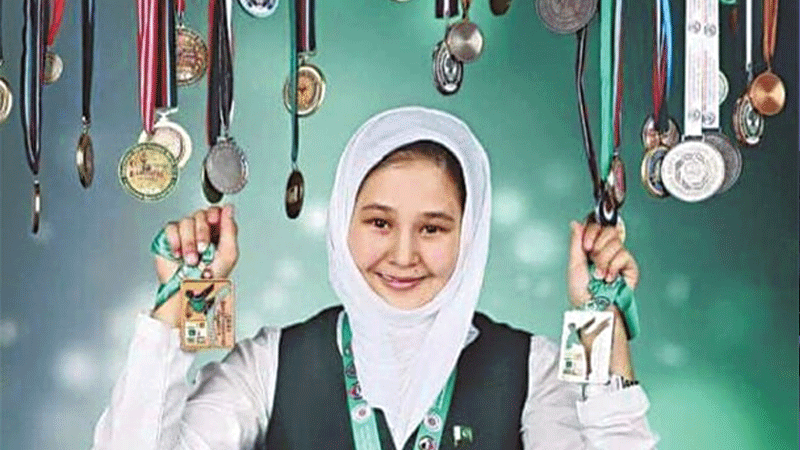 Having spent my childhood in the Hazara community, I feel real proud to see a female of this very hard working, friendly and peace loving community, to excel in martial arts. Being trained in Taikwando, I know how difficult and challenging it is to become relevant in this macho sport. Ms. Nargis, deserve all the praise , belonging to a backward part of Pakistan and especially belonging to persecuted Hazara community who live in stressful isolation & constant fear for decades together, to bring recognition to her people, province and above all to the country. My heartiest congratulation to her & in particular to parents of this outstanding athlete, who through their support and encouragement made it possible for her to bring glory & fame to the nation. I hope that that besides her study, she will spare some time to provide training to other female members of her community in the large interest of female participation in sports. I wish her success in future events too.